A leisurely morning start today. 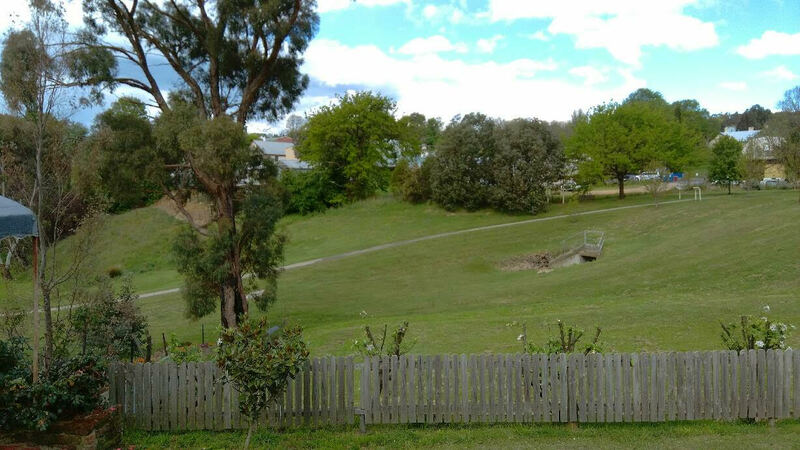 We didn’t have long to travel to our next destination – Paynesville at Lakes Entrance. A mere 100 odd kilometres. The skies were blue. The sun was shining. The air was pleasantly cool – not hot, not cold. Contrary to my expectations, the winding, curling, bendy roads were not behind us just yet. What was missing was the white out and the Total Terror Factor. In comparison to yesterday’s 200%+ terror , today was a mere 100%. For most of the drive I still had the death drop next to me. I would sneak a peak, nod, and close my eyes. He even pulled over for photo opportunities. Next to the death drop on my side. So kind. I opened the window, pointed the camera in the general direction and hoped for the best. Most of them didn’t work out. Lead Foot Tanska had made a reappearance too. He had to be reminded that the roads WERE still curvy, there WAS a death drop, and he was driving too fast. Admittedly there were stretches of straight road. leisurely stroll across the road. As we’d only had a quick snack for breakfast in the car as we left Omeo behind, we decided to stop at Bruthen for lunch. 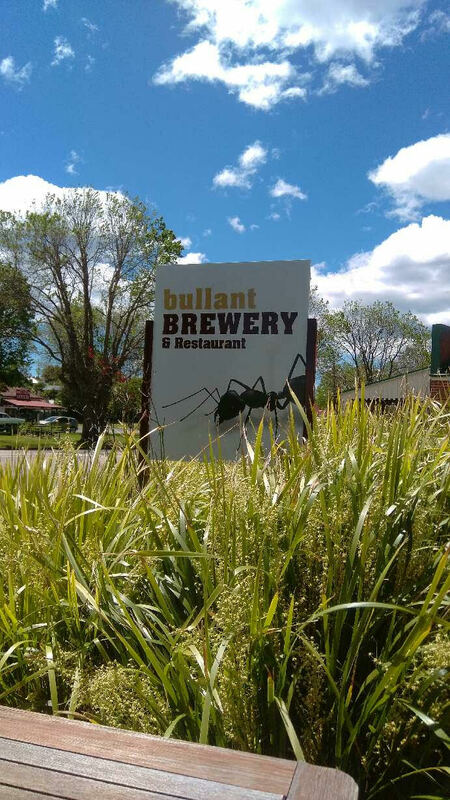 We had been to the Bullant Microbrewery on our last trip to this region. Fully booked, we were fortunate to get an outside table. Although the breeze was a little cool the pleasant warmth of the sun made up for it. A shared ploughman’s platter was more than enough. I’m not sure why it’s called the bullant brewery. Bull ants are big and nasty. If they get their fangs into you it hurts – a lot. But according to this article they are spectacular. Maybe that’s why. Apparently this mini brewery makes a spectacular beer. I assure you the scenery – what I saw of it – was spectacular. Rolling green hills. Herds of grazing cattle and sheep dotting the meadows. Babbling brooks. Blue skies and sunshine. A gentle breeze. We left the bullants behind and rolled down the hill towards Bairnsdale. A quick stop to get money and wash the car and we were wending our way to Paynesville. To the waiting arms of my sister and her husband. I am exhausted. Three days of curving, winding roads and looming death around every bend have depleted my reserves. I’m off to bed. There will be photos of even more spectacular country side in the days to come. Sounds like you’re having a great time! Glorious countryside. Get some rest. I sent you an email. Okay. Will do so now. I’m never happy driving with drops like that, Raili. The thing is, though, when you’re driving, you don’t have an option to close your eyes! Eek!!! I doubt I could have driven – there were a lot of cars pulled over hugging the mountainside – but we were going in the opposite direction. 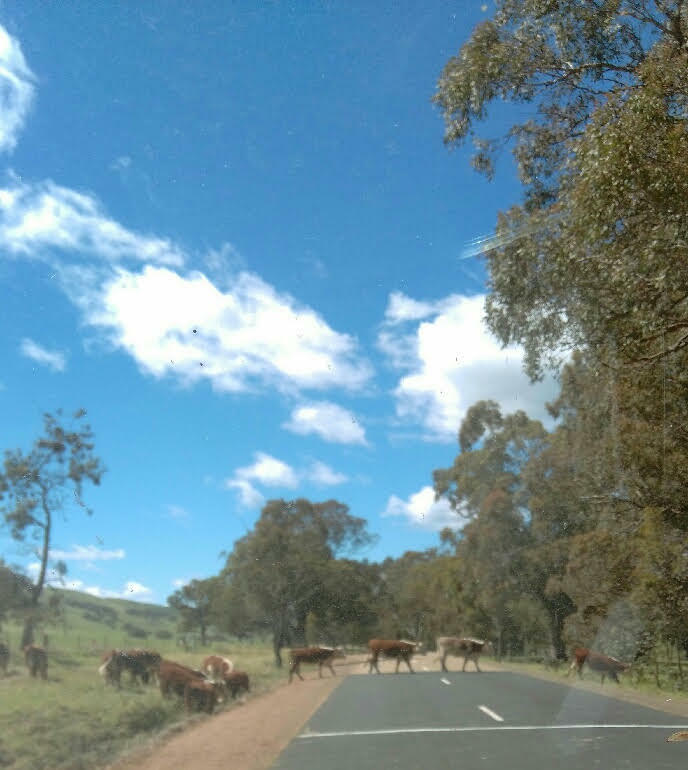 I don’t like long distance driving either – hubby does all that. He loves it. Yes, I have caught up on some sleep and relaxed. Lovely countryside pics. Can imagine you are not a heroine when you have death drops on your side of the road. I would definitely close my eyes as well and hope for the best.